Pablo Dominguez - Artist: Pablo’s art education includes study with wildlife painter Terry Isaac and plein air painter Paco Young in Montana. Enjoying the outdoors is one of life’s greatest pleasures and the oppurtunity to observe wildlife is a gift that I most certainly treasure. I have great respect for nature and as a Christian I worship its creator, believing that as stewards of God’s gift we have quite a responsibility. Of course in many instances we have failed, but because of the hard work of many commited people there are a great number of successes as well. As an artist I’m simply giving an intrepretation of what I observe in nature, and like any number of wildlife artists I hope the viewer of the work is perhaps inspired to feel a greater appreciation for not only nature and the animal kingdom, but the manner in which God has beautifully designed each piece to perform and function in such a cohesive manner. Born (1961) and raised in Michigan artist Pablo Dominguez began drawing around age 4,in between naps and eating paste. As a muchacho (Spanish for "youth"), many hours were spent exploring and working outdoors while visiting relatives in a rural area of Mexico with no electricity or running water, but plenty of animals such as goats, chickens, cows and horses. It was there that he discovered he made a pretty poor vaquero (cowboy), so he focused on his skills as an artist. The Christian artist summarizes his respect for the natural world by stating “I am continually amazed at the beauty, design, and purpose that almighty God has placed into his creation of nature and wildlife. And I don't say that in a whimsical or trite manner, but rather from an undersanding that the design, complexity, and order we see in all life points to a common designer rather than a common ancestor". Pablo’s art education includes study with wildlife painter Terry Isaac and plein air painter Paco Young in Montana. His travels across the United States include visits to areas such as Yellowstone, the Badlands, Audubon State Park, and the Great Smoky Mountains. His trips to wildlife refuge areas and large and small zoos also allow him many hours of observtion and study of wildlife and landscape. Pablo’s artwork continues to be accepted into many juried shows and fine art exhibits regionally where he has collected a respectable number of awards. July of 2004 saw his first one man show titled “Once Upon a Time In the Wild” open at the respected Starkweather Gallery in Romeo, Michigan, the gallery’s first time mounting an exhibit of strictly wildlife art. Also that year his portrait of a black rhino titled “After the Mudbath” was accepted into the international exhibit “Art of the Animal Kingdom IX”. Pablo’s artwork has appeared in Wildlife Art magazine and he is co-author (with Michigan wildlife artist Rod Lawrence) of an instructional art book on painting wildlife in acrylics for Walter Foster Publications. The year 2005 saw his work again accepted into the exhibit “Art of the Animal Kingdom X” in Bennington, Vermont, and the following year his painting titled "Brown Bear Brow" won the Henderson Breakfast Lions Club award, one of the top prizes given at the Kentucky National Willdife Art Exhibit. The artist and his wife Charlene currently share their home with their 4 cats, occasionally doing foster care work for a local animal rescue. 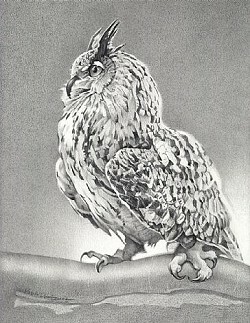 Thanks to Pablo Dominguez, who has donoated an original drawing of a Eurasian Eagle Owl and also gave us 6 of the limited edition prints. We are going to be Auctioning them to raise some much needed funds as the sanctuary is sruggling financially at this time of year.